An old well in a forest clearing. The well is, of course, the object in hex 0808. Note: This map was primarily made for testing purposes. Given the homogenous nature of the "green stuff" it would do well as bamboo or rhododendron - thick, heavy brush, often rising up to 10' and hard to penetrate without massive effort. 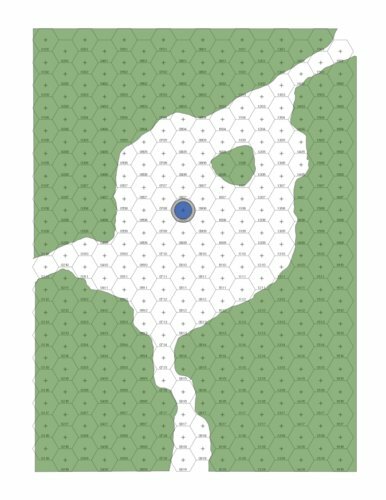 This would mean assailing the PCs with either small creatures that can pass through the brush or sending their opponents down the paths. Obviously the two encounters will play out very differently. More fantastical settings could have the enemy walk in across the tops of the brush wuxia style or have some "forest walk" ability that allows them to pass through it. This is also quite a confined space - range specialised PCs should feel hemmed in in a roughly ten yard square space. If you feel like drawing in tree-trunks this becomes somehow less restricted - the brush loses the feel of an impenetrable barrier and becomes terrain that can be moved through. This may not make things better. The green stuff could also be swamp and the white bits solid ground. For pure flavour, a well out in the middle of the wilderness is pretty significant (more so if it's elaborate and/or in a style alien to the local culture(s)). This also makes it a good place to meet random encounters - likely there to draw water for a nearby camp, or just resting by the water source.